On your next visit to the East Coast of Florida select a home, townhouse, condo or villa from Melbourne vacation rentals. With economical and comfortable vacation rentals designed especially for visitors to Florida, your business trip, vacation or family gathering will seem so much better. Whether you've come to Melbourne for the winter, summer, spring or fall, you can't find a better centralized area from which to tour Florida and you'll find the perfect quarters at Melbourne vacation rentals. 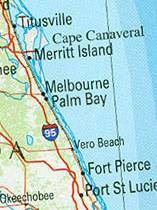 Melbourne is just West of Melbourne Beach, South of Titusville and the Kennedy Space Center. It is a perfect location from which to view space launches which, from this vantage, can easily be seen during the day or night. For local touring there are museums, preserves and eco parks along the coast as well as an abundance of water activities because of the Melbourne location on the Intracoastal waterway and Melbourne's closeness and access to the Atlantic Ocean. Like many other Florida East Coast cities, only the Intracoastal waterway separates the beach community from it's namesake and 2 bridges provide quick access to the sun, sand and surf. Orlando area and the major theme parks of that area are only about an hour's drive from most Melbourne vacation rentals.